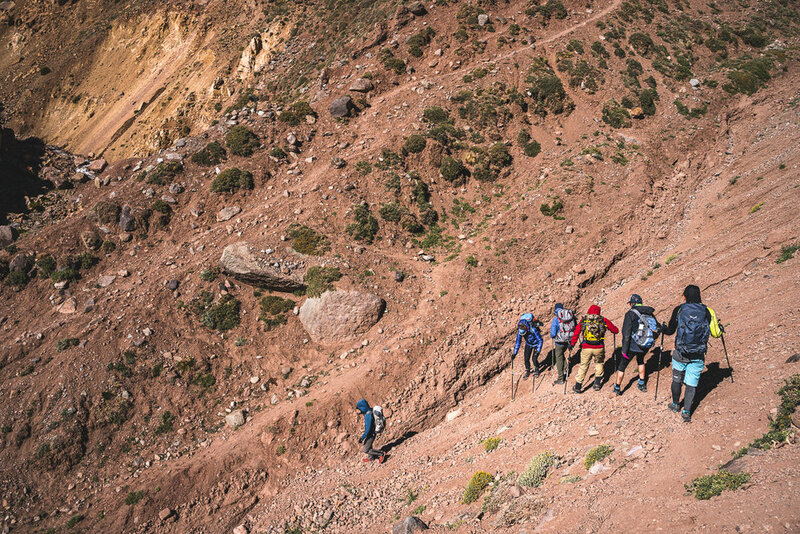 As we are standing at the entrance to Parque Provincial Aconcagua, getting a pep talk from our two guides Mariano and Guille, the gravity of this project starts to dawn on us. The highest mountain of South America isn’t even visible yet, although it towers more than a 1000m higher than all the mountains close to it. The day before we have traveled three hours from Mendoza to the little village Penitentes and are now ready to start trekking from Punta de Vacas. A total of over 4600m of elevation gain lies in front of us, starting at 2350m and finishing at 6962m, on top of one of the seven summits – the highest point in the world outside the Himalayas. 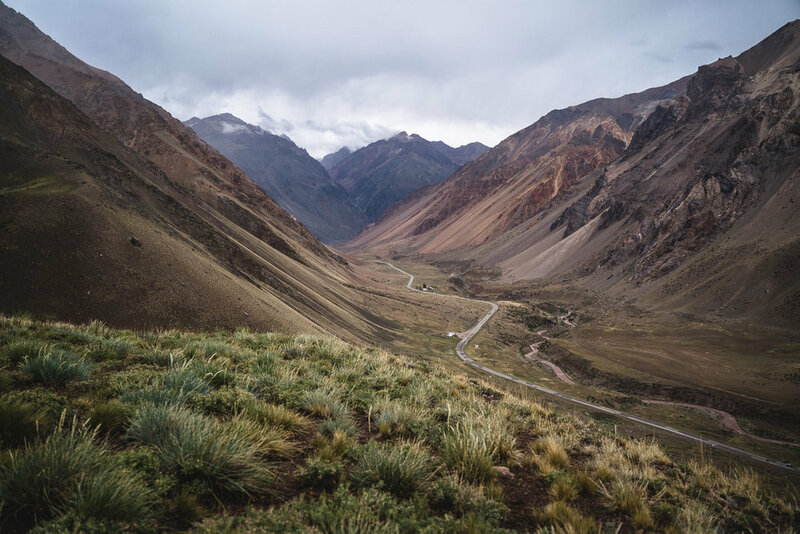 The routes on Aconcagua: We are attempting to climb Aconcagua via the Polish Traverse Route (sometimes also referred to as False Polish Glacier Route or 360-Route) going up the Vacas Valley. The Polish Traverse is less busy than the Normal Route through Horcones Valley, somewhat longer and meets up with the Normal Route on summit day. It is called the “360-Route” because you use the Normal Route for the descent, thereby almost completely going around Aconcagua. Fewer people, being able to see the mountain from all sides and having the diversity of another route going up and down, make the Polish Traverse Route clearly the best option in my opinion. Besides these two most common routes there are more technical options like the Direct Polish Glacier Route via the Polish Glacier on the West Face of Aconcagua. After a lunch break a herd of mules with their Arrieros (muleteers) overtake us in a cloud of dust. 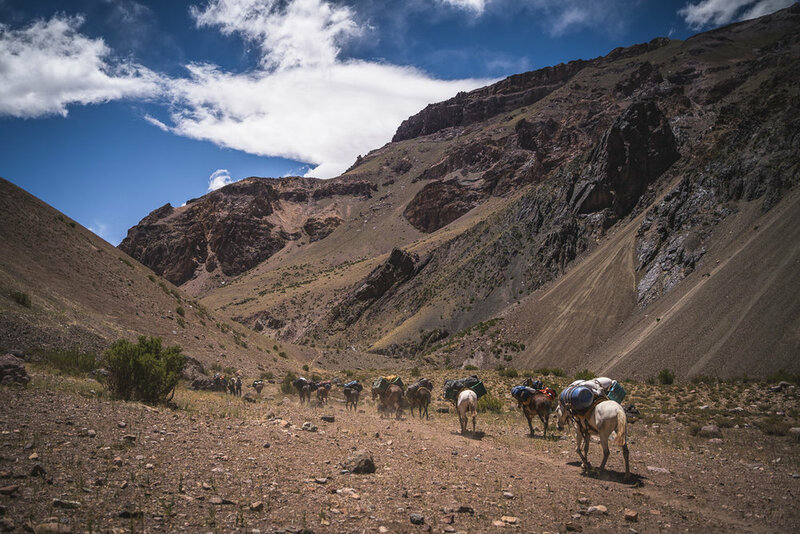 The mules will carry our luggage up to Base Camp, leaving us with just a light daypack during the approach. In the afternoon we reach our first camp called “Pampa de Leñas” at the side of the river. 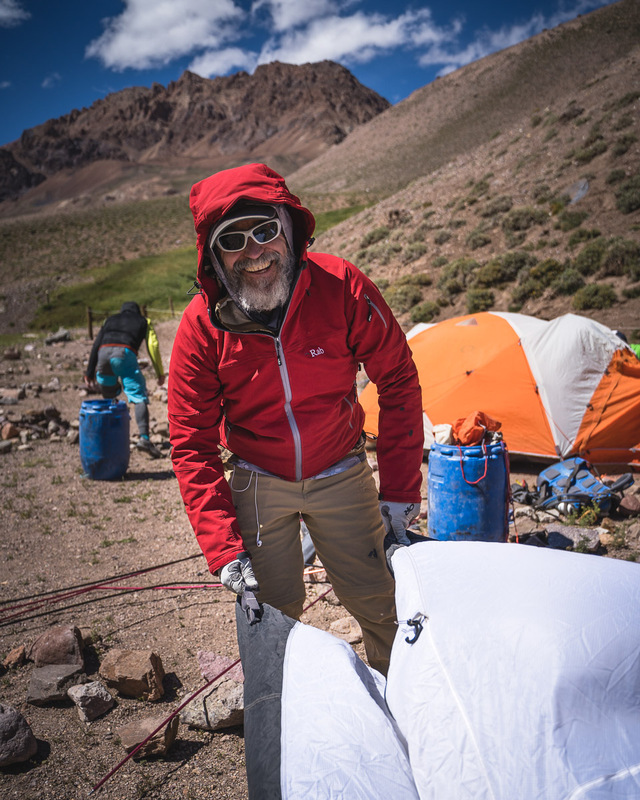 Now the task is to set up our Trango 3 expedition tents efficiently, while strong winds are whipping the parts around. In the evening the Arrieros are preparing a traditional Asado for us, an Argentinian barbecue, grilling different meats on an open fire. Since the approach days are not very demanding we stay up late into the night, feasting and drinking wine and beer under the starry night sky. On the second day we continue up the Vacas Valley, much like on the first day- still no sign of glaciated mountains anywhere. Behind every little river bend the valley stretches on. The wind is strong and wears you out even though the path itself is not that strenuous. Then finally, after a total of almost 30km, we get the first glimpse of Aconcagua. Looking into a valley to the left, we are seeing the mountain’s intimidating west face, so high and still so far away. 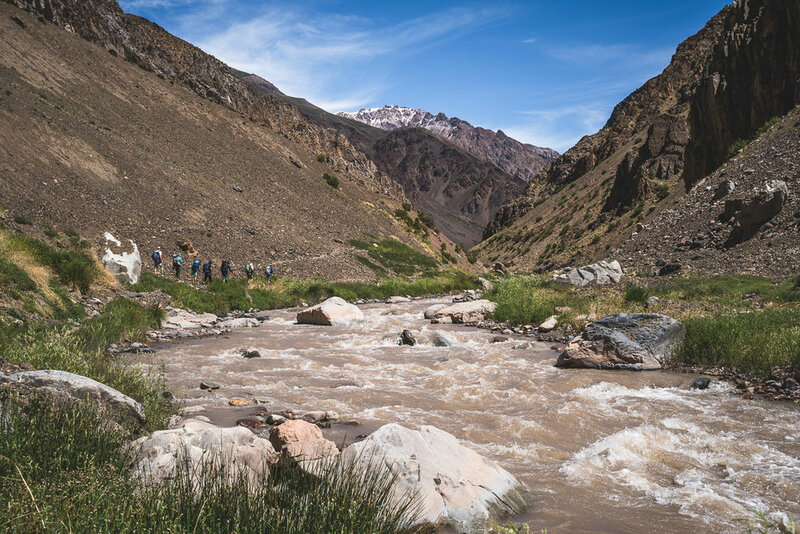 On the side of a vast, rocky river bed with a few streams in it, we complete the last meters to our second approach camp “Casa de Piedra”. The wind here is extremely strong, which is why it requires a real team effort to set up our tents for the night. The next morning we get up at 6am, long before the sunrays reach the bottom of the valley. Huddled together for breakfast we try to warm up with some tea and coffee. Every item that is not pinned down with a rock is knocked off the table by the wind. 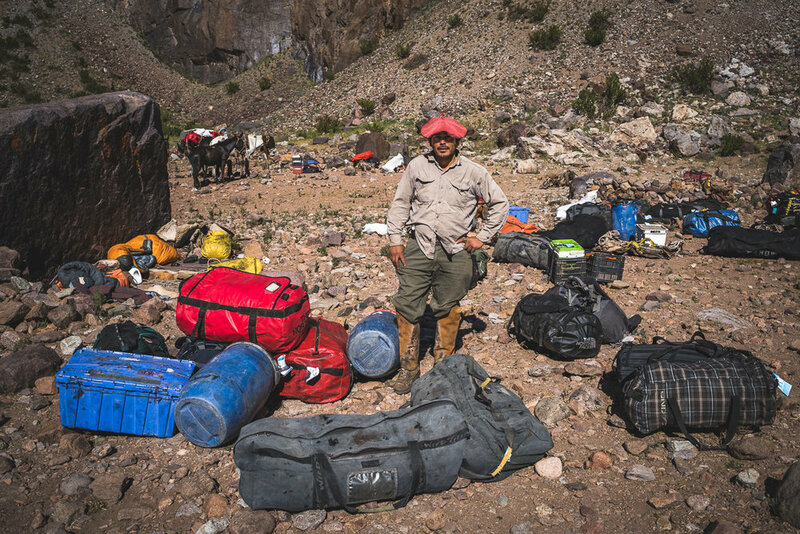 After the team has taken down the tents and packed their bags, we hand the luggage to the Arrieros and start making our way across the riverbed. 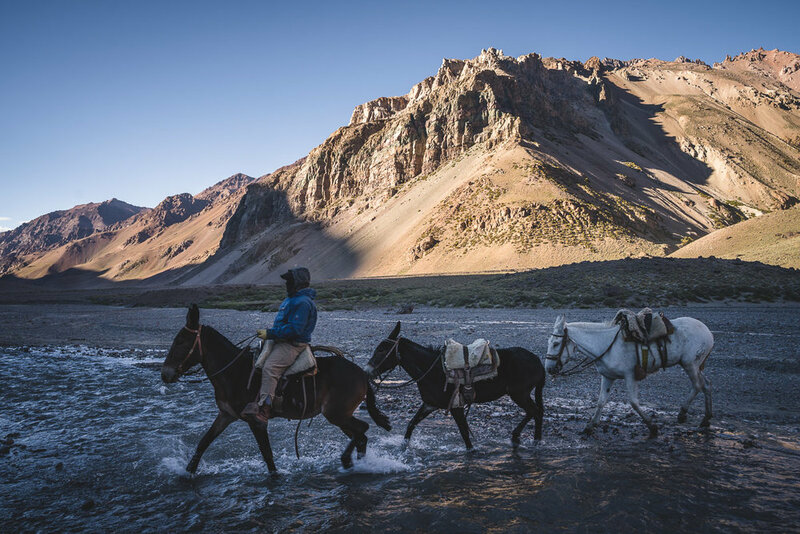 To cross the biggest arm of the river, we take turns riding three mules lead by an Arriero. White horse, pink gloves, ready to go! As we start hiking into the valley that will lead us towards the Aconcagua Base Camp Plaza Argentina, the first sunrays finally reach us. This valley is narrower and steeper than the Vacas Valley. 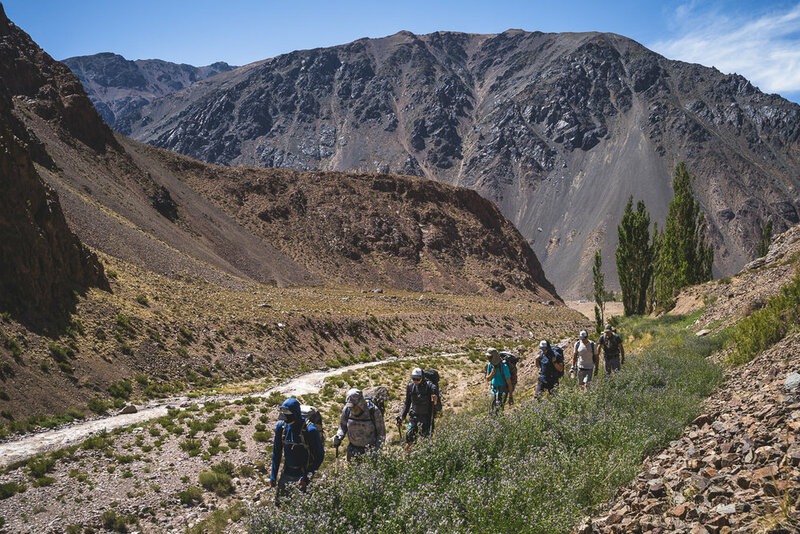 The first few hundred meters of elevation gain lead us up to a more open expanse behind which Aconcagua gets bigger with every step. After crossing another river we are met by a harsh and cold wind. For lunch we find shelter behind a huge rock so we don’t have to eat too much dust on our freshly made sandwiches. Continuing upwards we sometimes have to lean against the wind, which makes our progress tiresome. 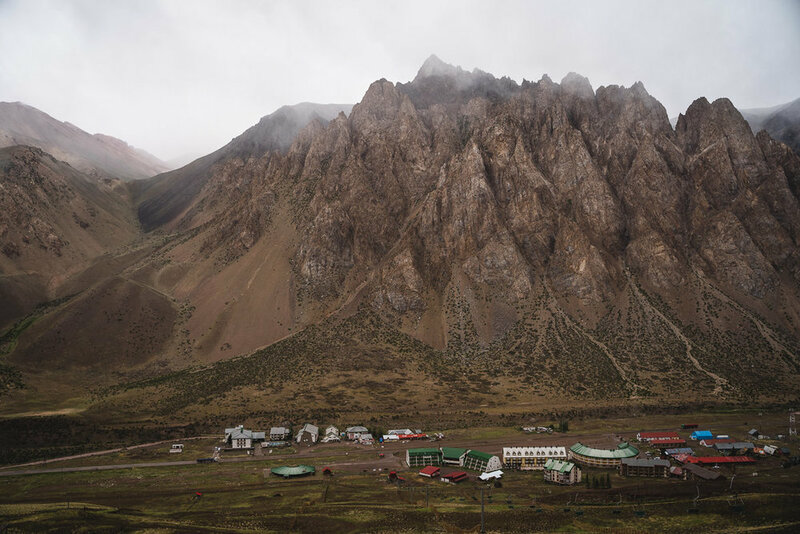 Then we reach an otherworldly red gravel bed where we find a sign with “Plaza Argentina” on it – Base Camp is now just around the corner. Upon getting to the top of a glacial moraine, there is a moon like landscape of gravel hills in front of us, dotted with dozens of colorful tents – we have made it to our base for the next four days. In a complex of dome tents from Grajales Expeditions our team gets assigned its very own tent. We are glad to have this comfortable space now, completely shielded from wind and weather outside. The mood gets even better when within minutes multiple pizzas are served, freshly prepared in the Grajales kitchen tent right next door. Excited for the base camp experience ahead of us, we settle in and enjoy the afternoon with good food and conversation in our dome. Soon I will write Part 2 about base camp life, acclimatization and the first supply and moving trip to High Camp 1 - stay tuned. In the meantime check out my article about Preparation and useful tips for climbing Aconcagua. To find more info on Grajales Expeditions visit their website. Let me know your thoughts and questions in the comments and please share with people who might be interested to climb Aconcagua!